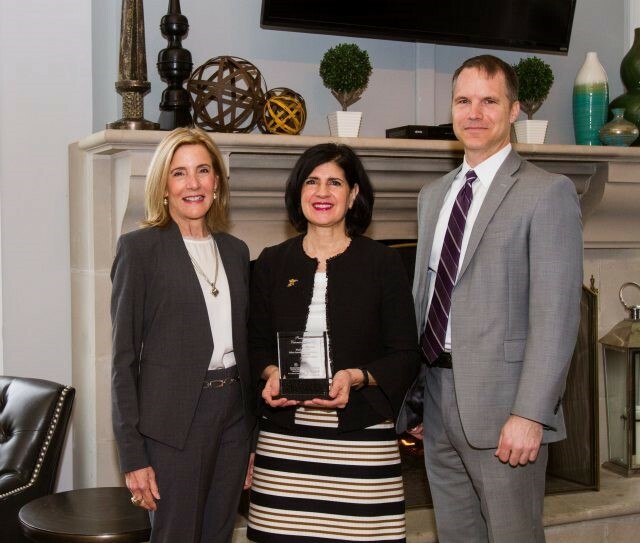 Marianne Post of Berkshire Hathaway HomeServices Fox & Roach Realtors in Medford, was awarded the 2017 President’s Visionary Award in the Sales Associate of Excellence category. Joan Docktor, President of Berkshire Hathaway HomeServices Fox & Roach, REALTORS, Marianne Post, a Medford Office Sales Associate and Rich Huder, Medford Office Manager. Congratulations to Marianne Post of Berkshire Hathaway HomeServices Fox & Roach Realtors in Medford, who was awarded the 2017 President’s Visionary Award in the Sales Associate of Excellence category. The Sales Associate of Excellence Award is an award that recognizes the agent who exhibits exemplary performance in the areas of professionalism, loyalty and commitment to the community and real estate profession. This agent stands out for his/her service to clients and fellow agents. The recipient of this award is an office leader who promotes a positive environment through participation and consistent example. The President’s Visionary Awards were established to recognize sales associates and managers who embrace a vision of caring, leadership and commitment. This annual award program is designed to applaud and honor select individuals for their valuable contributions to our company, to their communities and to their clients. The 12 recipients were chosen through nomination forms and recommendation letters from the regional managers for six different categories including Rookie of the Year (one winner per region) Mentor of the Year, Welcome Specialist and Sales Associate of Excellence.